— NASA's Curiosity Mars rover has left its first tracks in the Martian soil, leaving the coded mark of its maker in its trail. On Wednesday (Aug. 22), the car-size, six-wheeled rover took its first test drive since arriving on the Red Planet more than two weeks ago. Its drivers on Earth ordered Curiosity to roll forward about 15 feet, (4.5 meters), turn right and then back up about 8 feet (2.5 meters), such that when it stopped it was positioned to the left and roughly perpendicular to where it touched down inside Mars' Gale Crater. 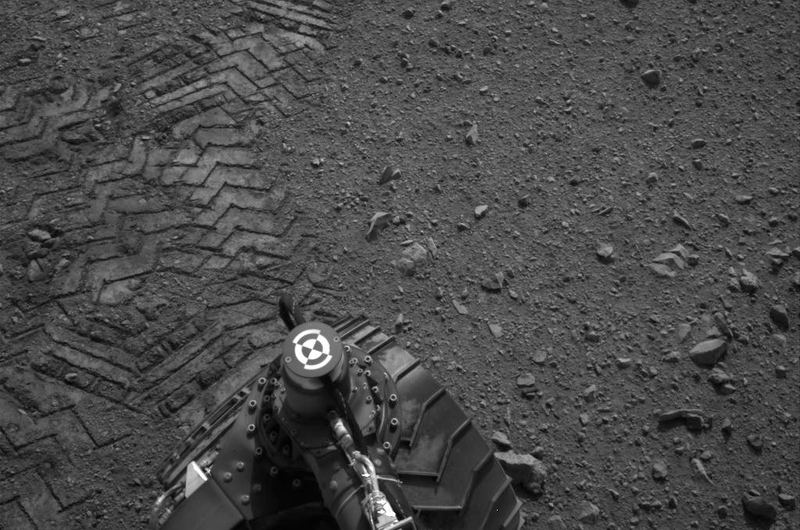 "You can see in the tracks how we drive forward, and then you can see roughly a circle, which is where the rover did what we call its turn in place maneuver," said lead rover planner Matt Heverly of NASA's Jet Propulsion Laboratory in Pasadena, Calif. "So it steered all of its wheels and then performed a turn of a 120 degrees, pivoting about a point in the center of that circle, and then it backed up." 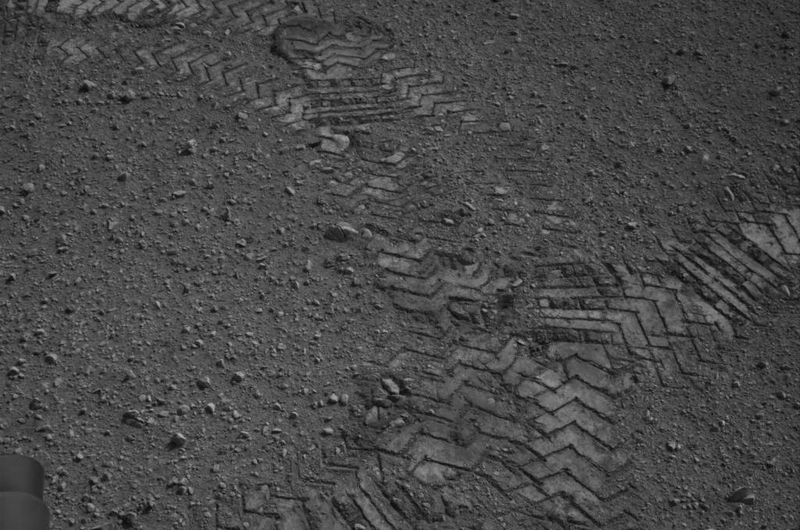 Curiosity's path to its new parking spot was emblazoned on the Martian surface by a series of dash and dot tread marks that were left in the soil by each of the rover's 20-inch diameter (50 centimeter) wheels. The track pattern, dot-dash-dash-dash, dot-dash-dash-dot, dot-dash-dot-dot (".--- .--. .-.."), spells out "JPL" in Morse code, which translates letters and numbers into a series of short ("dot") and long ("dash") signals. 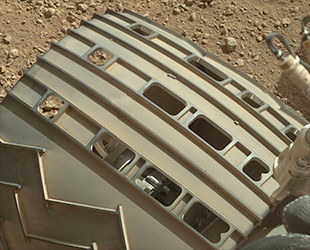 Curiosity's signature wheel-print was a nod to NASA's lead center for unmanned planetary exploration, which built the rover and now commands it as it prepares to explore Mars in search of conditions habitable to past or present life. The dashes and dots are more than just an autograph on the ground. 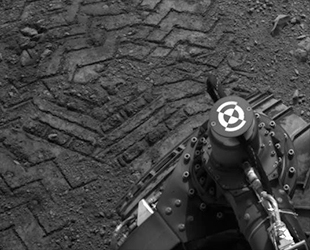 They serve as "visual odometry" marks, which allow Curiosity's engineers to determine the position and orientation of the rover, as well as how far it traveled, by analyzing images of its tracks. 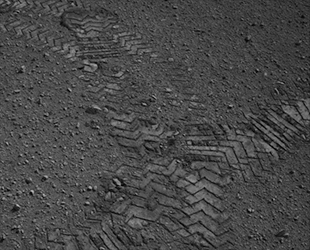 "We have intentionally put holes in the wheels to leave a unique track on Mars," Heverly said. "So if we are in sand dunes where we don't have lots of rock features around us we can use those patterns to do our visual odometry." 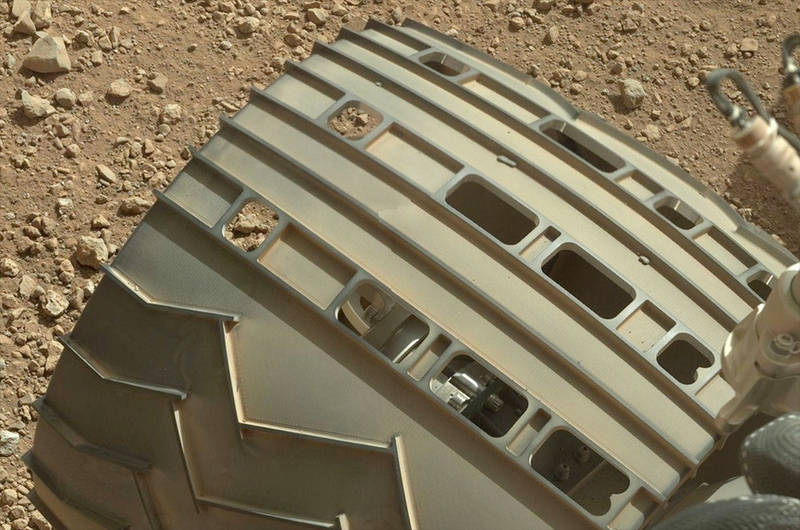 In addition to the Morse code JPL, Curiosity's wheels also feature a zigzag cleat pattern. 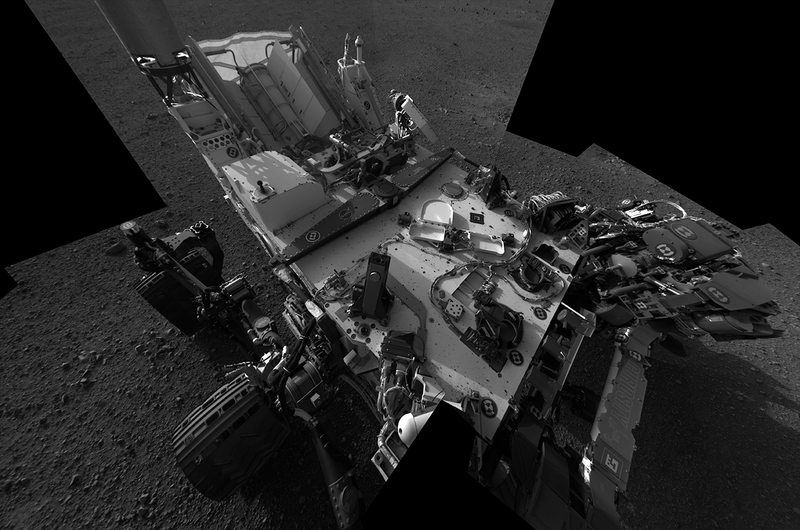 Curiosity's short test drive was the latest in a series of instrument and equipment checkouts that the rover needs to pass before heading out toward its first major science target. Earlier this week, Curiosity extended its 7 foot (2.1 meter) robotic arm, which is capped by a turret of tools including a camera, drill, spectrometer, scoop, and the mechanisms for sieving and portioning samples of powdered rock and soil. "We unstowed the robotic arm and took a look at the tools on [its] end. It's kind of a Swiss army knife there where we have a lot of instruments," said Curiosity mission manager Michael Watkins of JPL. "We wanted to make sure all of that was working by doing these first motor checks, and all of that went successfully." The mission's science team also powered up Curiosity's rock-zapping laser for a bit of target practice, focusing the light beam at a fist-size rock named "Coronation." 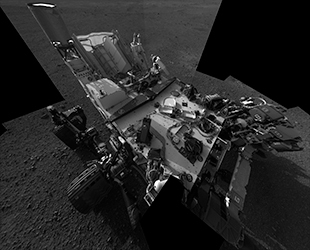 Curiosity's Chemistry and Camera instrument (ChemCam) uses laser induced breakdown spectroscopy to determine the composition of its rock and soil targets. The science team also powered up and began collecting data with the rover's on board weather station, the Rover Environmental Monitoring Station (REMS), which revealed the first problem of Curiosity's mission. 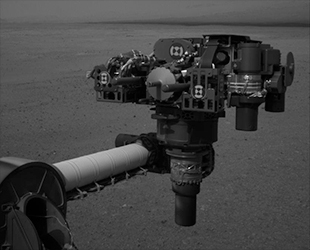 The wind sensors on one of the instrument's two booms has been damaged, perhaps due to debris being kicked up off the surface during the rover's retrorocket descent. The wind sensors on the other boom, which extends out from the rover's camera mast, is working as expected. 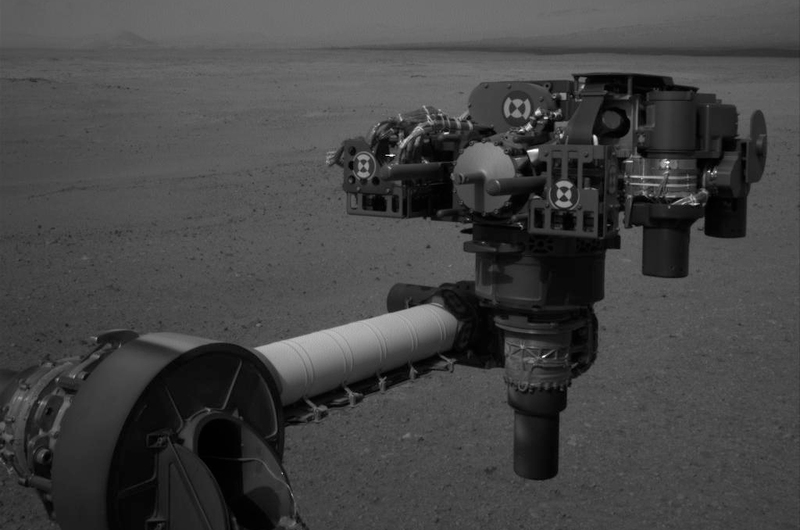 "We still retain nearly the full capability, just with a little bit of ambiguity in terms of wind direction," Curiosity's deputy project scientist Ashwin Vasavada said. Curiosity's ultimate destination will be the base of Mount Sharp, a 3.4 mile high (5.5 kilometer) mountain that rises from Gale Crater's center. But before it sets off to explore the foothills, Curiosity's first long drive will be to an area closer to its landing site dubbed "Glenelg." Glenelg, which is located about 1,300 feet (400 meters) from Curiosity's landing site, denotes an area where three kinds of Martian terrain intersect: a kind of bedrock that may be suitable for eventual drilling; a terrain showing the marks of many small craters that could represent an older or harder surface; and a third kind of terrain that may be the same rock texture as the bedrock that was exposed when the rover's descent stage blew away dust from the surface. Curiosity's departure for Glenelg was planned to begin on Saturday (Aug. 25), or Sol 20, the rover's 20th day since landing on Mars, but as scientists want to study the areas disturbed by the retrorockets at the landing site, the drive may be delayed by several days. Once underway, that drive could take up to two months to complete, depending on how often Curiosity has to stop along the way. The rover's drivers eventually want to cover about 330 feet (100 meters), or roughly the length of a football field, in a Martian day, but it's going to take them some time to ramp up to that rate. "This first set of drives... we will probably do that in pretty small chunks, just to evaluate what's going on," Watkins said. "My guess is that those are going to go in 10- to 20-meter chunks but eventually we'll get up to over a hundred meters a day."